Norman Charles Creighton (1909–1995) was born to Charles Jolly and Harriett (nee Hendry) Creighton in Bedford, Nova Scotia. He graduated from the Maritime Business College in Halifax in 1929, where he took classes in correspondence, typing, and shorthand. He worked as private secretary until he was struck down by pulmonary tuberculosis in his early twenties. After his recovery three years later, Creighton settled in Hantsport, where he established a plant nursery and began beekeeping. He spent the majority of his adult life in Hantsport with his older sister Laleah; neither sibling married. Creighton's writing career did not begin until 1941, when he was in his early 30s. That year he created "The Gillans," a dramatic serial about a farming family for CBC radio's Maritime version of the Farm Broadcast. The serial was highly successful, but very demanding of Creighton, who was required to write five scripts a week. He resigned in 1949 but continued to do freelance work for CBC Radio as a writer for the short-lived weekly serial "Three of a Kind," and as a writer and broadcaster of radio talks. These short talks were among Creighton's most popular works, and he created them on a regular basis for over three decades. In the early 1950s, Creighton began writing for print. His short stories were routinely rejected from magazines, but his non-fiction articles were more successful, appearing in the Atlantic Advocate and Maclean's. Although he had several published articles, Creighton's career as a magazine writer never became anything more than flirtatious; his attentions were directed at radio and the new medium of television. In 1955, Creighton moved to New York City to take a course on television writing at Columbia University. He spent five years in New York City, but his career as a writer for the new medium never took off, and he was forced into menial office work to pay the bills. After leaving New York City, Creighton returned to Hantsport and resumed his career as a freelance writer and broadcaster. During the 1960s he worked on special projects for CBC Radio and CBC International, which included interview shows on the town of Lunenburg and the V. E. Day riots in Halifax, and a short series of comedy shows called "The Rum Runners." In addition to his regular radio talks, Creighton also wrote radio plays, acted in several CBC Radio dramas, and penned the occasional magazine article. Creighton took on fewer projects as the 1970s progressed, but he researched and recorded radio talks until his retirement in the 1980s. Creighton was a member of the Radio Writers' Guild, the Alliance of Canadian Cinema, Television and Radio Artists (ACTRA), and a founding member of the Writers' Federation of Nova Scotia (WFNS). Creighton was a prolific writer, but little of it has been published. In 2001, Creighton's neighbour Hilary Sircom edited Talk about the Maritimes, a compilation of Creighton's essays accompanied by paintings and poems created by his older brother Alan Creighton. The Norman Creighton fonds was donated by Jan Goodlad (niece) in approximately ten accessions between 1996 and 1997. Goodlad was in possession of the majority of Creighton's papers, but acquired some materials from Helen Hendry (Creighton's cousin), Hilary Sircom (Creighton's neighbour), and Heather Davison (relationship to Creighton unknown). 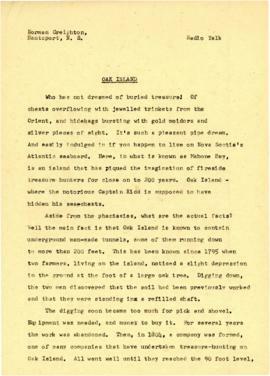 Fonds consists of materials created and collected by Norman Creighton, including radio scripts; published and unpublished manuscripts for short stories and articles; correspondence; audio tapes and records; research notes; newspaper and magazine clippings; photographs; financial papers; memorabilia. Materials primarily relate to Creighton's long career as a writer and broadcaster, but also include materials relating to his personal life and family history. Fonds is arranged by type of material and includes the following series: CBC Scripts, Correspondence, Family Estate Documents, Fiction, Financial, Memorabilia, Nonfiction, Notebooks, Photographs, Printed Materials, Radio Talks, Records, Research Files, Subject Files, The Gillans, Titus Smith. Two correspondence files and two subject files are restricted until the dates indicated in the series descriptions. For the papers of Creighton's older brother Alan Creighton, see also MS-2-701 in the Dalhousie University Archives. Relevant materials may be found in the fonds of other members of the Creighton family, including the Wilfred (G.W.I.) Creighton fonds (MS-2-264) and the Catherine Creighton and Family fonds (MS-2-656). Preferred citation: [Identification of item], Norman Creighton fonds, MS-2-689, Box [box number], Folder [folder number], Dalhousie University Archives, Halifax, Nova Scotia, Canada.